Bouncing Buttons crafts making it simple: Gift For My Mom and My New Toys. Rob's xbox caught the red ring of death (that silly machine breaks a lot). The death of the Xbox ended up being wonderful news for me!!! Rob bought a new PS3 with lots of extra stuff (games and such) and he gave me the same amount of money to spend on whatever I wanted!!! I knew exactly what I wanted andwasted no time spending every last penny of my money. I bought the singer 250 futura sewing/embroidery machine (I have wanted this machine for about 2 years now). Note to everyone this machine has BAD reviews on Joann.com BUT I joined the Futura yahoo group and purchased my machine from WWW.SINGERTEXAS.COM . I felt confident that between the singertexas support and the 5,000 members on the yahoo group I would be able to find a solution to any "beeping problems". I have had my machine for a week now and have no problems. I bring up my bobbin thread and hold the ends for the first few stitches (like I do in free motion quilting) and I have had no problems with my machine. I have done about 60 or so trial embroideries and one finished project (shown at the bottom in this post) I know some people don't like singer machines. I LOVE THIS MACHINE!!!! I noticed that doing embroidery is more like quilting than sewing so I can see how some sewers or people learning to sew can struggle learning how to use an embroidery machine. I think a quilter would have an easier time learning. It wasn't hard to use at all!!! Within a couple hours of opening the box I was embroidering things. With the extra money I had leftover I also bought a huskystar embellisher (felting machine) this is something I have been looking at for about a year (safe way to let my children felt). I love felting and being a yarn spinner I have lots of wool around to use with this machine. I also got a few other things (jumbo embroidery hoop, new presser foot,and some linen fabric). I have been having lots of fun playing with my new toys (that is the reason I have been MIA in blogland). I just noticed that I have 50-100 projects that I haven't blogged and I see I am getting into my old routine of not taking pictures of finished projects before giving them away. I have made several things that I didn't bother taking pictures of (I hope nobody asks me how I made them because I know I will not remember). I need to try and do some catching up so I might try posting twice a day to catch up (if I can find enough free time in my days to do that). The first thing I NEED to share is a garden bucket. I made it for my Mom for a Mother's Day gift. 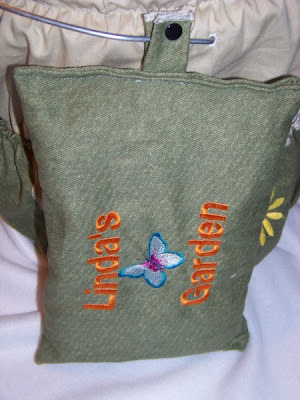 I plan to make 2 more for gardening friends and I am worried if I don't write about it now I will forget how I did it. I can't make the other two until Rob brings me home some more buckets. 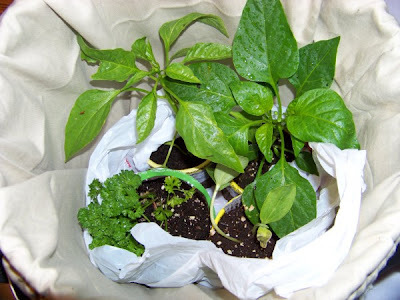 To make it all I did was slip covered a 5 gallon bucket (the slip cover I made looked like a huge pillowcase) . I put the closed end inside the pail and folded the open end around the front. 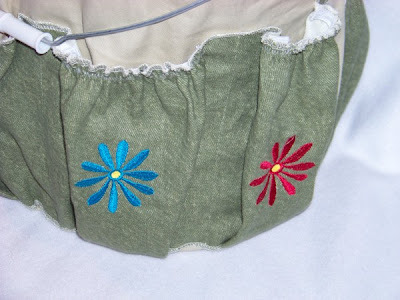 Elastic around the top of the "pillow case" is what holds the cover snug on the bucket. I now wish I would have taken pictures of the bottom of the bucket and a picture of what the cover looked like when it wasn't on the bucket. I will try to do that when I make the next one. Pockets on the front of the bucket is just one long rectangle. I added elastic in the tops of pockets after I stitched them on because the pockets looked way to loose (tools hung WAY out). 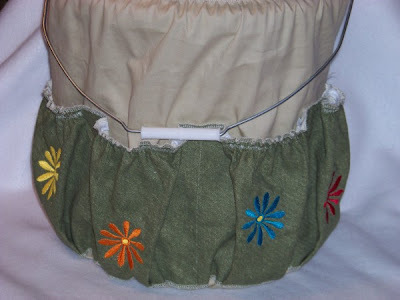 My next bucket I think I will add elastic across the top of the fabric before I stitch it on to make pockets. I will also tuck under my ends so stitches don't show. I didn't do that on this first one because it was easier to design the pattern this way. I thought putting the flowers up and down would make it look like flowers growing. The problem is when the pockets are full of large things the flowers look more like mistakes than flowers growing so the next one I will line up all the flowers near the top of the pockets. I do like the look of the embroidered flowers on the pockets. I think the flowers staggered high and low looks nice on the empty pockets (to bad it doesn't look as nice when the pockets are full). Below is a picture of the back side. I made a pocket for seed packets and two other large pockets. 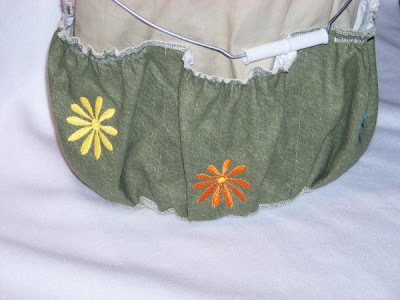 For the 2 pockets on the bottom I ran elastic across the top first then sewed the pockets on. I think if I run one huge pocket strip with elastic on top that goes all the way around the bucket it will be easier to sew it together and it will make snug pockets (things won't fall out if bucket gets knocked over). BUT I am not sure that is the way I should make it because I do like the look of the front pockets a bit better so I will need to do some thinking about this before making my next one. If I ever make one for myself it would be easy to tell if the bucket falls over and needs the tight pockets or if the loose nicer looking pockets hold everything inside. Can you picture how it would hold tight and look snug if the back pocket in the picture above ran all the way around the bucket? I know this would make it a quick sewing project BUT I do like the shape of the pockets on the front side of bucket a bit better. My Mom's name is Linda (I guess you already figured that out). 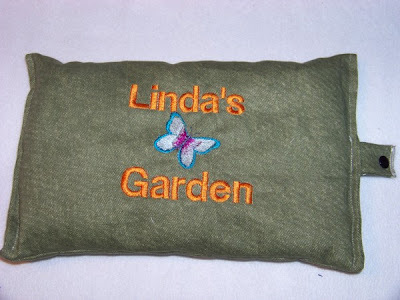 This was originally going to be a pocket but it didn't look right on the bucket so I turned it into a gardening pillow. It attaches to the bucket handle with a snap. you can see the button hole I added to the cover so the handle and the bucket can attach without messing up my cover. I made one nice button hole and one not so perfect button hole. I am not sure what hole this is (my luck it is the not so nice button hole). NOTE TO SELF... Don't sew button holes late at night. You always mess at least one up when you are tired wait until the morning to sew any button holes!!!! For the next bucket I will tuck in the stitching above the snap and top stitch it so it doesn't show. Below is a picture of the stuff I stuck inside the pockets. 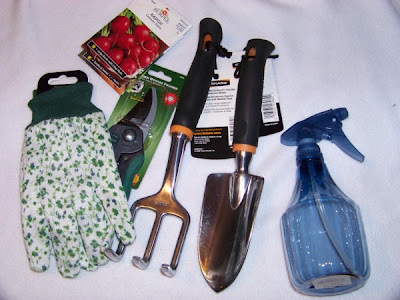 I assumed she already had a nice set of gloves and gardening tools so I bought all cheaper things that she could use if hers bend or get lost (or let grandchildren use when they want to help). They are more for looks to fill the pockets than they are "gifts". I had plans for my children to decorate wide pop craft sticks for plant markers to fill the last pocket but I somehow misplaced my huge box of craft pop sticks (shh don't tell my mom she doesn't know her gift wasn't complete). Below is an odd angle of the bucket. It really looked much better than this (at least I think it did). I wish I would have taken a closeup picture of the watering can and the ladybug. 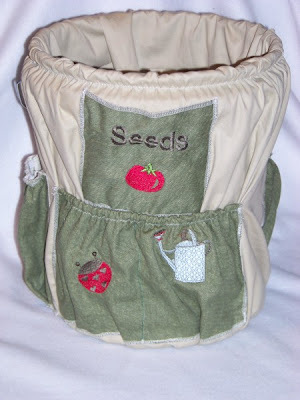 The watering can embroidery looked so nice (it was a free one I found online but I can't remember the web page right now). You can see a close up of the elastic around the top in this picture. I ran elastic around the bottom of the bucket and around the rim. I figured it was the best way I could think of to hold the bucket cover on and keep it from sliding around. 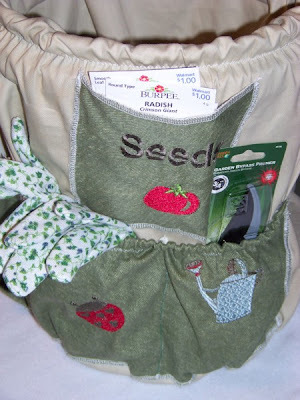 Below is a picture of the front side full of gardening stuff. Notice how the lower flowers look bad when pockets are full? They look like crushed flowers (not the growing flower look I was going for). Inside the bucket I stuck 4 small veggie plants. I figure she can use the inside to carry out plants or a watering can. She can fill the inside of the bucket with weeds when she is weeding. And she can fill it with her fruits and veggies when it is time to harvest. 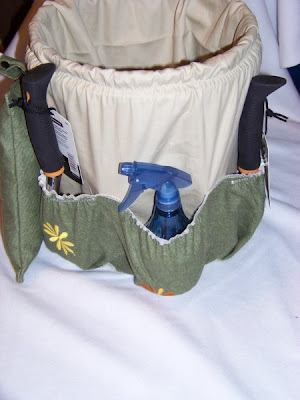 OR she can use the inside as a place to stick sprinkler or other gardening tools out of the way. I feel bad that this project was not perfect for my Mom (I always feel this way after making my first of anything). This is the way my designing goes. I don't use patterns so I often have a hard time taking a picture in my head and getting it to work right on real materials. The first of anything I make is usually functional but always has lots of room for improvements. My Mom (like all Moms) is happy with anything her children make (even a child that's 38 years old). She doesn't mind the mistakes (this is the reason my mother gets the first of almost anything I make). Many times I only make one and never feel like making anymore. So even though my mom sometimes ends up with my worst projects she often ends up with the one of a kind projects that nobody else gets. I had TONS of fun designing it. It was a lot of fun and I learned a lot about how I can improve on this idea for my next one. I feel good that it ended up being a functional garden bucket (but really how can a store bought bucket not function as a bucket). Starting with a bucket was an instant success. I think before starting my next one I need to decide on the pocket style and elastic placement. Once I figure out what pocket style I like the best making many more garden buckets should be easy. I have plans to make 2 more and I think by the time I finish them I will have my pattern set up the way I like it.